RENCI is attending the 2013 iRODS User Group Meeting in Garching, Germany this week. The meeting is being hosted by the Max Planck Institute of Plasma Physics (IPP). Our second presentation at the meeting is about the beta release of Scotty, the iRODS Administration Interface. 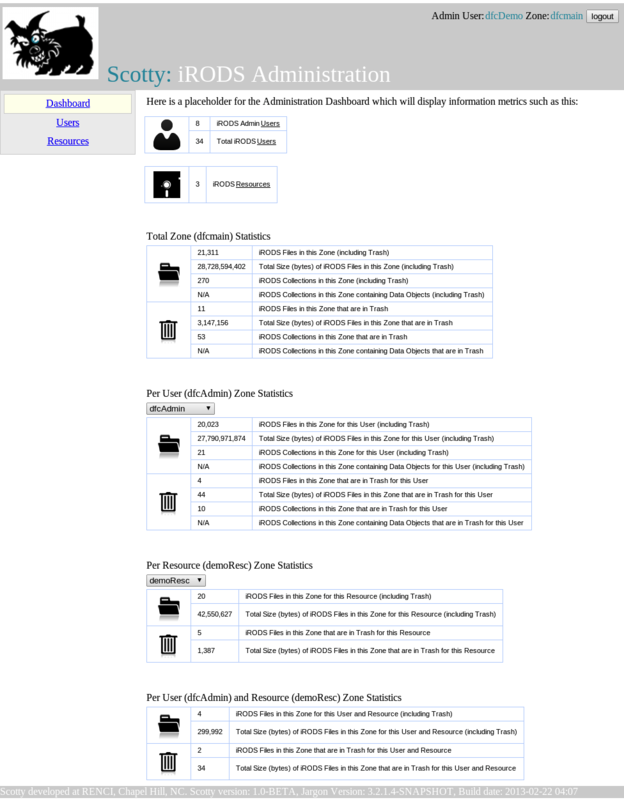 Scotty is a web-based iRODS Administration dashboard that can connect to any running iRODS Zone (grid). Connections are limited to iRODS users with the “rodsadmin” designation. Scotty is a java application that runs on Tomcat and uses the Jargon API to communicate with iRODS. The iRODS server can be either local or remote. Scotty provides cumulative statistics for users, resources, and files in a single Zone as well as user and password management. Since Scotty can be installed and run separately from the iRODS server (from any capable networked computer) and provides a dashboard for any iRODS Zone, it stores no connection information and no metric information locally.